Average Height	: 8" - 10"
Average Weight	: 6 - 8 lbs. The Maltese was first recognized as a breed in Malta, where it received its name. They were first brought to England by Crusaders returning home from the Mediterranean more than 2,000 years ago. It is said it was developed by breeding miniature spaniels and with Miniature Poodles. It is thought to be the oldest of all the European toy breeds. Grecian, Egyptian and Roman art objects adorned with Maltese picture images, and predating Christ, and dating back 3,000 years, have survived to this day. Ancient Phoenician seamen took them everywhere throughout the Mediterranean world, using them to barter for goods. It was left behind at many places along the trade routes. The breed was well established on the island of Malta long before the Roman occupation. Catullus, a well known and admired Roman poet of that era, wrote, in very flattering terms, of the little dog, "Issa" who belonged to Publius, the Roman governor of Malta, in the first century. In England, whether the breed arrived by returning crusaders, or much earlier, with the invading Romans, it was quite well known at the time of Elizabeth I (1558]. •	Hypo-Allergenic ~ great for those of you with pet allergies. •	Malteses’ coats can mat easily, so will require regular brushing, combing. •	Intelligent, alert & full of fun. •	Adaptable to numerous lifestyles. •	A great companion pet. •	Adapts well to sedentary life, although loves to be active if called upon. •	Great with children and other dogs. •	No major health issues. The Maltese is among the most gentlest-mannered of all little dogs. They are very affectionate, playful, loving and cheerful. Full of Personality, enthusiastic and energy, they are known for their sudden and wild outbursts; running in circles, or at top speed in all directions. Recommended as a great candidate for the first-time dog owner, these lovable companions want nothing more than to be with YOU. Adoring and devoted to their masters, they are eager to please, and can be very protective of their owners. If they feel other animals or people may possibly be a threat to you, or their territory, they will frantically bark and possibly try to bite the intruder. They are uninterested with objects or animals larger than themselves, they are without fear; they act like big dogs trapped in a little dogs' body. Bold and quick to sound the alarm at suspicious noises and strangers, they can tend to be barky. Lively and spirited, they are fairly easy to train and highly intelligent, quick to learning tricks and commands. Though some may be a bit stubborn, as their lovable nature and cuteness tends to make them be very spoiled. They love to play outdoors and have a "thing" for jumping in puddles, or anything they can make a mess of themselves. Males and females are equal in temperaments. They can be snippy with rough children, as they are very fragile and break easily. On the other hand, they do get along great with other dogs, cats, and small animals. Some may be difficult to housebreak, as well as being picky eaters. Because of their devotion to their owners, they tend to suffer from anxiety issues when left alone for long periods of time. Daily grooming is required to keep your Maltese coat clean and snarl free. Many owners will keep them what is commonly referred to as a "puppy cut", where the hair is kept 1-2 inches all over the entire the body, where they then closely resemble a puppy. Though for ones that are keep in a coat for conformation, a lot more upkeep is needed. They often wrap the long hair to keep it from matting and snarling up. Dead hair needs to be brushed and plucked out, as the breed does not shed; the coat will become matted if the dead hair is not removed. Maltese owners find it easier if after washing using shampoo, adding a "leave in" conditioner will help alleviate any knots and snarls while combing. It is very important that all shampoo and conditioner residue is completely gone from the coat, as the coat will fray and snarl very easily. Towel dry until damp. Finish drying him off by using a hand dryer. Never use high heat is it will ruin the coat by causing the hair to break off. Using a pin or slicker brush, brush with the direction (or grain) of the hair; make sure each section is completely dry before moving on. Make sure not to forget his head and feet as these areas tend to mat easily. Maltese often have tear staining, the dog's eyes water excessively and turns the hair around the eyes a dark brown-black color. It is not really known what causes tear staining, though most owners have found that using bottled water vs tap water does decrease the amount of staining. It is also possible to have their tear ducts flushed, which may or maynot help. The Maltese exercise requirements are very minimal, mostly due to their size. Indoor games, a romp in the yard or a short walk on leash is more than enough then to keep them fit and trim. They can become overweight very easily; it is important that they get regular exercise. One should wait until they are at least 8 months old to start jogging, or any long-distance walking. They make a great choice for the elderly or disabled person, or those with limited space, such as apartment dwellers. Due to being highly intelligent, the Maltese are very easy to train. In that regard, it is due to being spoiled that most problems arise. They breed itself is known to be hard to housebreak. Because of their size, some owners will use "pee pads", in which the dog learns that it is alright to go to the bathroom inside the house. Even if you are successful with training them to go on a pad, the dog will be accustomed to using paper, and may then intend to go to the bathroom on any paper, or paper-like objects left on the floor. Using a crate is one of the best methods to housebreaking, as well as constant supervision. Use a leash or rope to tether them to yourself; this will keep them from wandering off and relieving themselves. When 100% attention can not be paid to them, they should be put into their crate. Upon waking, before and after playing and eating, and before settling in for the night, they should be let outside to go to the bathroom. By using special treats only used for when they go outside, and lots of praising will soon get the dog onto the right path of being housetrained. 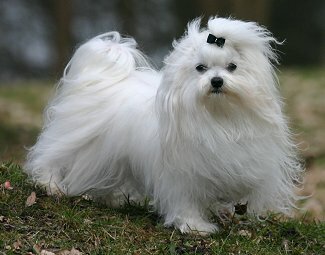 More so than other breeds, the Maltese need a large amount of companionship with their people and do not like being left alone for long periods of time. They can become destructive by chewing and ripping apart your house, as well as constantly barking in their frustration. By giving them a bone, or a toy aimed for mental stimulation, will keep them occupied and less destructive, but it is not a cure. If you are not home for long periods of time, or can't take a break in your schedule for one on one time, then this is not a breed for you.